I guess it all depends on your perception of sharp and just as there are varying degrees of sharpness there are equally numerous ways to achieve it. 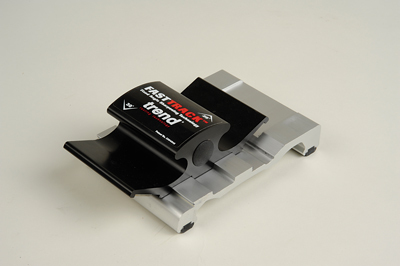 Trend's Fasttrack honing device will achieve a keen edge on chisels and plane irons by wiping a small diamond plate across the blade. It doesn't feel at all natural but it works. The kit comes with a coarse - 220 grit - plate for preparation of the edge and a fine one - 450 grit - for finishing. These can be expanded to include 90, 600 and 1,200 grits. The system will tackle 25° and 30° with any of the diamond plates in both positions. As soon as you have created a wire edge dress it with the finer of the two plates or invest in a specific accessory that fits to the underside of the bottom component. There's no setting up required. Insert the blade into the device and hold it firmly with one hand against a square set shoulder and slide the top plate back and forth. The only stipulation is that the blade needs a flattened or, better still, polished back to get the best results. 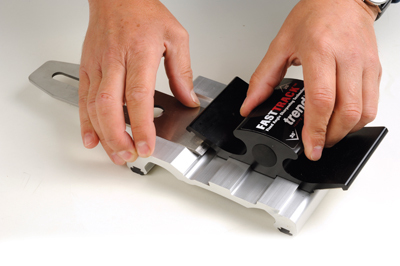 It will help if your blade is ground to the correct angle in the first place as removing a lot of material will take a while with the 220 grit plate supplied. Apart from a little oil to lubricate the dovetailed slides, it's a completely dry system and perfect for taking on site. The instructions suggest 'little and often is best' and with this device you can afford to stop frequently to keep a good edge without spending time setting up. The two components are made from heavy gauge anodised aluminium extrusions and require minimum maintenance. Fine woodworking it's not, but a good result quickly is assured. I doubt it is going to replace any of your existing sharpening methods but as a quick solution when out and about, it is really rather effective. All you need is a flat surface and a little elbow grease.